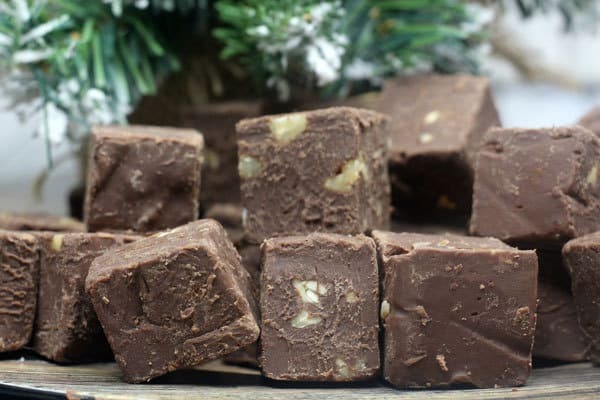 As you probably have realised Chocolate Fudge is one of our favourite Christmas indulgences but I have a second. I absolutely love Irish Cream Liqueur or Baileys. I only ever get it at Christmas Time and I will enjoy it with coffee on an evening watching Christmas Movies or after dinner with guests when we entertain. Combining the two to create an Easy Chocolate Baileys Fudge Recipe seemed to be perfect and this simple quick recipe is perfect for giving to others as an edible gift this Christmas. Although chocolate fudge is delicious! I sometimes find it a bit rich, so to give it a little bit extra, not only does this simple and easy to make recipe have Baileys Irish Cream in. It also has delicious chopped pecans which give it a bite as well. Although we have made this recipe on the stove it is easy to make in the slow cooker as well. 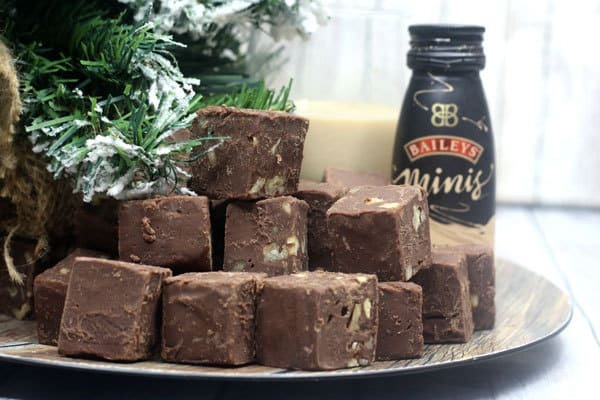 Scroll down to find our Slow Cooker Easy Baileys Fudge Recipe below the printable recipe card and discover how easy it is to make fudge in the slow cooker or crockpot. 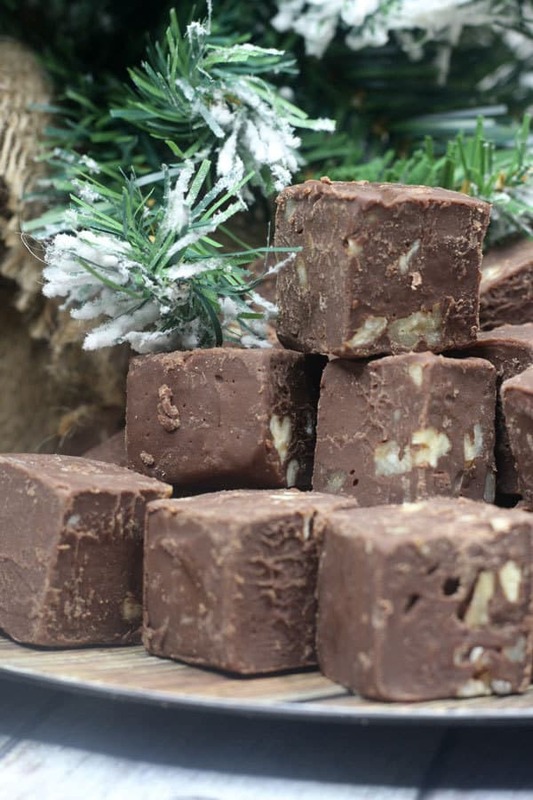 Once you have made the fudge you can obviously treat yourself to it but it’s easy to gift it to others as well. Why not put it in a mason jar with pretty ribbons and a gift tag and give to your neighbours and friends to share the Christmas Cheer. 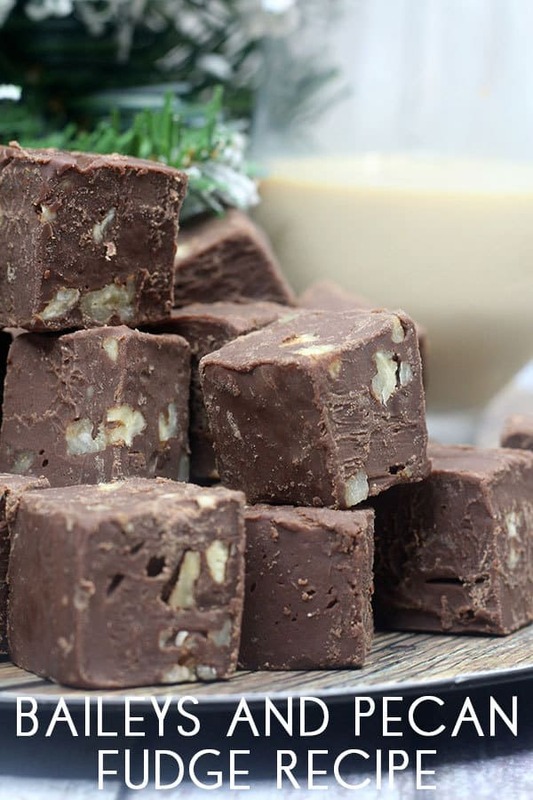 It also makes a great alternative to Christmas Cookies for a Cookie Exchange and this Irish Cream Fudge is sure to be a hit with those that love the chocolate and pecans. 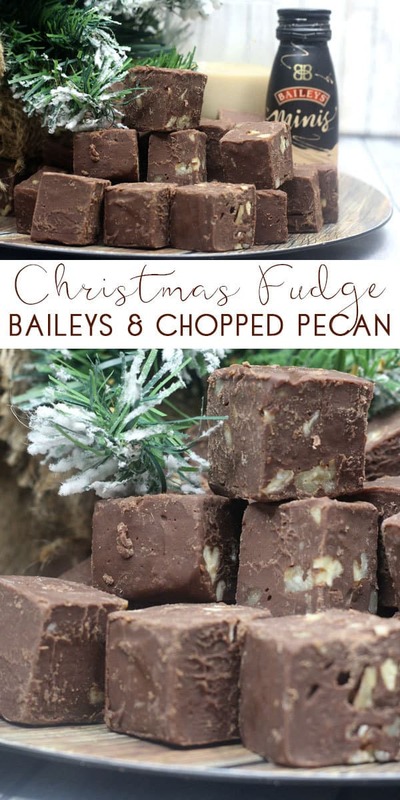 Delicious, simple and easy recipe for a Sweetened Condensed Milk fudge with Baileys and Chopped Pecans. Perfect for Christmas Treats and edible gifts for friends and family. Using a double boiler melt the chocolate chips with condensed milk in the top of the double boiler. Remove from heat and stir in the oil, vanilla, Baileys Irish Cream, and chopped pecans. Smooth the fudge until even. Refrigerate for 2 hours to set. 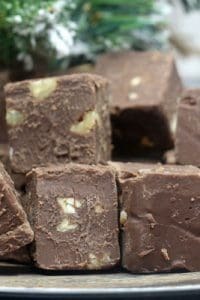 I love making easy fudge recipes and switching from making it in the double boiler to making it in the slow cooker is SO EASY and makes recipes like this possible for kids to make. Start as you would above with preparing your tin. Then into the slow-cooked add the chocolate chips and sweetened condensed milk. 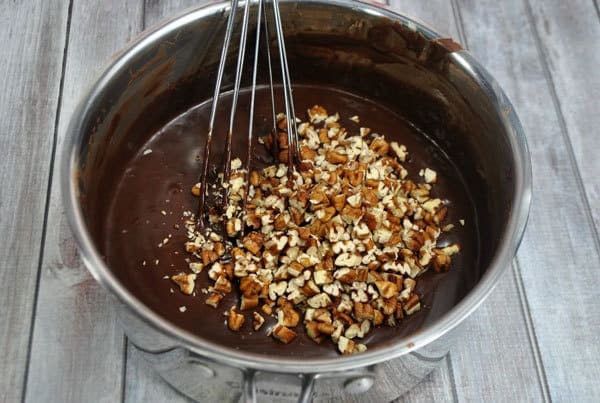 Set the slow cooker to a low heat and melt the chocolate stirring it together with the condensed milk (around ever 2 minutes as it will melt slowly). Once it’s melted add in the vanilla, Irish Cream and Vegetable oil and stir until well combined. Now add in the chopped pecans and stir. Once combined pour into the prepared tin and leave for 2 hours to set. 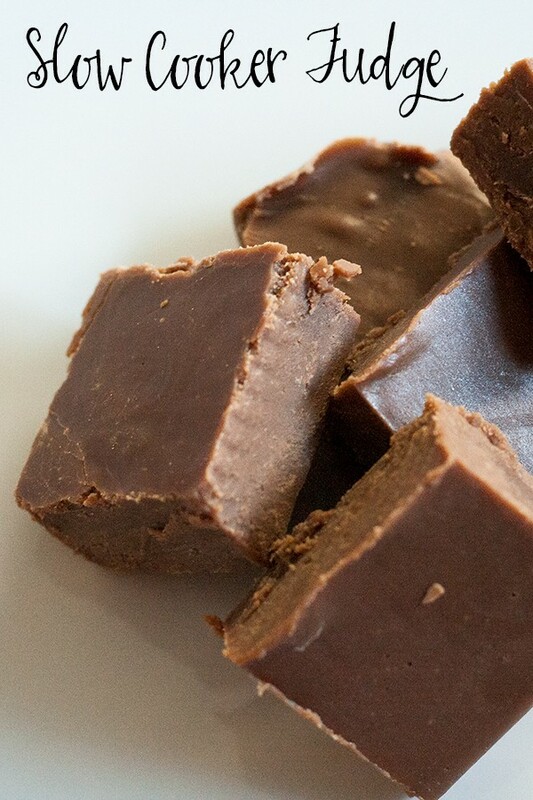 Simple Slow Cooker Chocolate Fudge Recipe that is so easy even kids can cook too. Two of my favourite flavours combined – chocolate and orange. 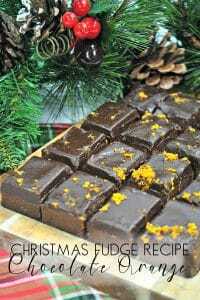 It’s like having a Terry Chocolate Orange in Fudge form check out the Chocolate Orange Fudge Recipe to make this year. 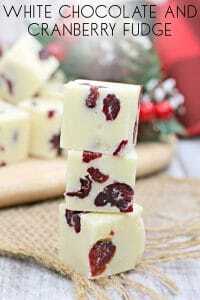 Cranberries are one of my favourite Christmas foods – combined with Fudge you have the perfect treat in my eyes and this Easy White Chocolate and Cranberry Fudge is SOOOOOO simple to make.